"Bongos" redirects here. For the American pop band, see the Bongos. For other uses, see Bongo (disambiguation). Bongos (Spanish: bongó) are an Afro-Cuban percussion instrument consisting of a pair of small open bottomed drums of different sizes. In Spanish the larger drum is called the hembra (female) and the smaller the macho (male). Together with the conga or tumbadora, and to a lesser extent the batá drum, bongos are the most widespread Cuban hand drums, being commonly played in genres such as son cubano, salsa and Afro-Cuban jazz. A bongo drummer is known as a bongosero. The origin of the bongo is largely unclear. Its use was first documented in the Eastern region of Cuba, the Oriente Province, during the late 19th century, where it was employed in popular music styles such as nengón, changüí, and their descendent, the son cubano. Most sources on Afro-Cuban cultural history argue that the bongo derives from Central African (Congo/Bantu) drum models, noticeable in the open bottoms. Also a Santería influence from Yoruba culture in the symbolic "twin" drum is assumed. The strong historical presence of Africans from the Congo/Angola region in Eastern Cuba (where the bongo first appeared) makes such an influence probable. Moreover, Central African/Congo influences are also documented in the Cuban son music genre, including changüí, and initially the development of the bongo drum went parallel with these genres. From such conceptual African drum models, the bongo developed further in Cuba itself, and some historians state that the attaching of the two drums was a later invention that took place in Cuba. Therefore, the instrument has been described as "African in concept but Cuban in invention". Sexteto Habanero in 1925. First from the left is Agustín Gutiérrez, the bongosero. His tuning lamp is on the floor (circled). The bongo entered Cuban popular music as a key instrument of early son ensembles, quickly becoming—due to the increasing popularity of the son—"the first instrument with an undeniable African past to be accepted in Cuban “society” circles". This is attested, for example, in poems by Nicolás Guillén. As son evolved and distanced itself from its precursor, the changüí, so did the bongos. The bongos used in changüí, known as bongó de monte, are larger and tuned lower than their modern counterparts, have tack-heads instead of tunable hardware, and play in a manner similar to the lead conga drum (quinto) and other folkloric lead drum parts. Unlike modern son, changüí never extended its popularity beyond eastern Cuba, and hence its bongos remain a rare sight. It is commonly accepted that the son reached Havana partly as a result of the arrival of musicians members of Cuba's ejército permanente (permanent army), which brought music from eastern Cuba with them. Among the first known bongoseros to enlist in the ejército permanente in Santiago de Cuba was Mariano Mena. During the sexteto era, son groups began performing and touring more than ever before, and for the first time, recordings were being made. It was in this context that the first great innovators of the bongo made their mark, and unlike their predecessors, their names were not lost in time. Of particular note were Óscar Sotolongo of the Sexteto Habanero and José Manuel Carriera Incharte "El Chino" of the Sexteto Nacional, the two leading groups of the 1920s and '30s. Sotolongo himself would later leave the Habanero and direct his own group (uncommon for a bongosero), the Conjunto Típico Cubano. His replacement was Agustín Gutiérrez "Manana", who is widely considered one of the most influential bongoseros, partly due to his condition as an Abakuá member, which allowed him to develop techniques based on the ekué (secret drum) drumming of such society. In 1930, Sotolongo's son, Andrés Sotolongo replaced Gutiérrez in the Habanero. Decades later, at 82 years of age, Andrés Sotolongo was recorded for the Routes of Rhythm documentary playing alongside Isaac Oviedo. The 1930s saw an increase in the technical skill of bongoseros, as evidenced by Clemente "Chicho" Piquero, whose virtuosic performances inspired a young Mongo Santamaría to take up the instrument. [note 1] By the early 1940s, Santamaría had become a master of the instrument, performing with the Lecuona Cuban Boys, Sonora Matancera, Conjunto Matamoros and Arsenio Rodríguez's "Conjunto Segundo" among others. Arsenio had pioneered the conjunto format by incorporating a tumbadora (conga drum) into the rhythm section and having the bongosero double on cowbell. Arsenio's long-time bongosero was Antolín "Papa Kila" Suárez, who is often cited as one of the greatest of his time along with Pedro Mena of the Conjunto Matamoros. Arsenio's group also helped break the barriers of race, which particularly affected bongoseros. For example, the Orquesta Casino de la Playa did not allow their black bongosero Ramón Castro to perform on stage, nor was Arsenio allowed on the tres. 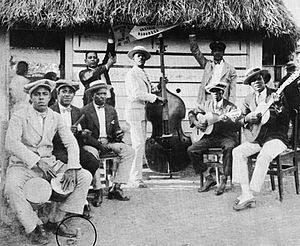 The Casino de la Playa would also feature bongosero Cándido Requena, who later joined the Conjunto Kubavana and Conjunto Niágara, and became one of Cuba's foremost makers of bongos and tumbadoras. Following the popularization of the tumbadora, Santamaría switched to the instrument, while remaining a close friend of bongosero Armando Peraza. Both moved to New York by 1950, bringing their music abilities with them. Among the bongoseros who stayed in Cuba were the aforementioned Chicho Piquero, who had become a close friend of Benny Moré in Mexico and became his Banda Gigante's bongosero back in Cuba. Also important during the 1950s were Papa Gofio of the Conjunto Rumbavana and Rogelio "Yeyo" Iglesias, the main bongo player in Havana's descarga scene. 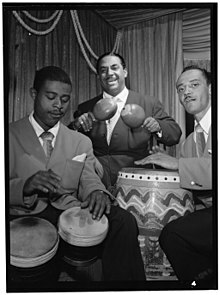 José Mangual Sr. on bongos (left) alongside Machito on maracas and Carlos Vidal on conga at the Glen Island Casino, New York, 1947. Spearheaded by the iconic conguero Chano Pozo, the late 1940s saw an exodus of Afro-Cuban percussionists from Cuba to the United States. Among the leading bongoseros of Cuban origin in the United States were Armando Peraza, Chino Pozo (unrelated to Chano) and Rogelio Darias, who had a long career in Las Vegas and was known as the King of the Bongo. Many others, however, would become primarily conga players, such as Mongo Santamaría, Sabú Martínez and Cándido Camero. The Latin music scene of New York, and the US in general, was primarily constituted by Puerto Ricans, and many influential bongoseros were Puerto Ricans who learned from Cubans. An early example is Rafael "Congo" Castro, who arrived in New York in 1924 and had a long career as a bongosero in Chicago until the 1980s. In New York, many Puerto Rican bongoseros would go on to join the pioneering Afro-Cuban jazz ensembles of the time such as Machito and his Afro-Cubans, whose singles "Tangá" and "Mango mangüé"—considered the first examples of the genre—featured José Mangual Sr. "Buyú" on bongos. Mangual's prolific career was continued by his sons José Mangual Jr. and Luis Mangual, who played in a variety of salsa groups in the 1970s. The two biggest Latin orchestras of the 1950s in New York, led by Tito Puente and Tito Rodríguez, were home to two generations of bongoseros represented by Johnny "La Vaca" Rodríguez and his son Johnny "Dandy" Rodríguez, of Puerto Rican ancestry. Other Puerto Rican musicians who made a name for themselves on the bongos were Richie Bastar of El Gran Combo de Puerto Rico, Ralph Marzán of Johnny Pacheco's charanga, "Little" Ray Romero, Frank Colón and Roberto Roena. On the other hand, American master bongoseros include Jack Costanzo and Willie Bobo, the latter more active on timbales. Other bongoseros who had more impact as timbaleros were Manny Oquendo, Orestes Vilató and Nicky Marrero. American novelty rock acts such as Preston Epps and Michael Viner's Incredible Bongo Band capitalized on the popularity of the instrument as well as its "exotic" and rhythmic qualities. Bongo drums produce relatively high-pitched sounds compared to conga drums, and should be held behind the knees with the larger drum on the right when right-handed. It is most often played by hand and is especially associated in Cuban music with a steady pattern or ostinato of eighth-notes known as the martillo or "hammer". They are traditionally played by striking the edge of the drumheads with the fingers and palms. The glissando used with bongó de monte is done by rubbing the third finger, supported by the thumb, across the head of the drum. The finger is sometimes moistened with saliva, or sweat before rubbing it across the head. When used in art music compositions they are usually struck with drum sticks. These drums can also be played on a stand, as is the case with concert orchestras and bands. ^ Some musicians were able to effectively translate their technical skill into pure showmanship, as was the case with Lázaro Pla, known as Manteca, who toured with the Lecuona Cuban Boys in the 1940s and became an attraction in Havana in the 1950s. He later moved to Miami and released two albums as a leader in the 1970s. ^ a b c d e Fernández, Raúl A. (2006). From Afro-Cuban Rhythms to Latin jazz. Oakland, CA: University of California Press. pp. 22–41. ^ "Some notes on Afro-Cuban music and dancing". The Inter-American, Vol. 1. 1942. p. 32. ^ a b Sublette, Ned (2004). Cuba and Its Music: From the First Drums to the Mambo. Chicago, IL: Chicago Review Press. pp. 338–339. ^ Orejuela, Adriana (2006). El son no se fue de Cuba (in Spanish). Havana, Cuba: Letras Cubanas. p. 26. ^ Encuentro de la cultura cubana. Asociación Encuentro de la Cultura Cubana. 2003. Issues 28-31. ^ Liner notes of Cuban Dance Party: Routes of Rhythm Volume 2 (1990). Rounder Records. ^ Acosta, Leonardo (2003). Cubano Be, Cubano Bop: One Hundred Years of Jazz in Cuba. Washington, DC: Smithsonian Books. p. 75. ^ Collazo, Bobby (1987). La última noche que pasé contigo (in Spanish). San Juan, PR: Cubanacán. p. 417. ^ Salloum, Trevor (2007). Fun with Bongos. Pacific, MO: Mel Bay. p. 2. ^ Moore, Robin (1997). Nationalizing Blackness: Afrocubansimo and artistic Revolution in Havana, 1920-1940. Pittsburgh, PA: University of Pittsburgh Press. p. 143. ^ Mauleón, Rebeca (2005). Salsa Guidebook for Piano and Ensemble. Petaluma, CA: Sher Music Co. p. 75. ^ "Remembering Rogelio Darias". Congressional Record Index, Volume 156, A-K, L-Z, Part 10. US Congress. February 4, 2010. pp. 1248–1249. ^ Flores, Carlos (1996). "Rafael "Congo" Castro: One of the Last Performers of his Generation" (PDF). Kalinda! (Spring 1996). ^ Conzo, Joe; Pérez, David A. (2010). Mambo Diablo: My Journey With Tito Puente. Bloomington, IN: Authorhouse. p. 218. ^ Salloum, Trevor. The Bongo Book Mel Bay.